Ald. 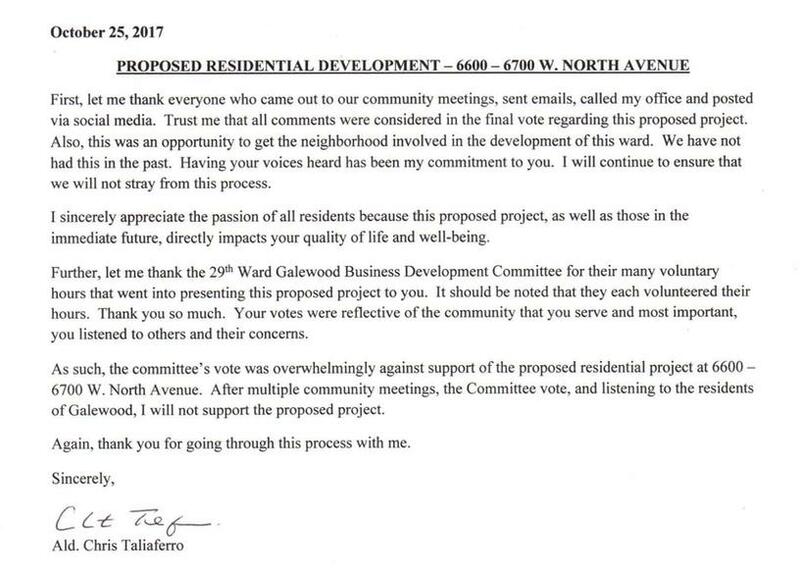 Taliaferro's Business Development Committee voted against the proposed residential project at 6600-6700 W. North Avenue. http://www.oakpark.com/News/Articles/10-31-2017/North-Ave.-luxury-apartment-proposal-nixed/?utm_campaign=WJ-News&utm_medium=Outbound-Email&utm_source=WJ-News-10-31-2017; https://gallery.mailchimp.com/0c1018748d53b6a11536e8215/images/947274fc-ca49-4e9f-8e3a-5697f1265c4d.jpg This Wednesday Journal op-ed laments the decision. http://www.oakpark.com/News/Articles/10-31-2017/Short_sighted-on-North-Ave./ T-NAD did not take a position on the project. But we generally favor residential development in The District. Due partly to the Internet, there is simply not enough market demand for all its office and retail space. More North Ave. residents will mean more customers for our many good businesses. Sources say the former IHOP, 6501 W. North, has been sold for $400,000. Seritage has not yet chosen a local company to develop the North/Harlem Sears site, but a mixed use retail/residential project is very likely. As noted in the last update, the North/Harlem property is a prime site, given its size, corner location on two major thoroughfares, heavy bus passenger volume and proximity to CTA and Metra lines. Oak Park has issued an RFP to developers for the parcel it owns at 6641-6643 W. North Avenue. This is the second RFP for this property. http://www.oak-park.us/sites/default/files/rfp-rfq/2017/final_rfp_attachments_combined_11.17.17.pdf Here's a news story about this. http://www.oakpark.com/News/Articles/10-19-2017/Oak-Park-searching-for-North-Ave.-developer/?utm_campaign=WJ-News&utm_medium=Outbound-Email&utm_source=WJ-News-10-19-2017 If no acceptable proposals are received, NABA and T-NAD would like to see the property used for employee permit parking, an approach suggested by Trustee Taglia. It would bring in some revenue and help relieve parking pressure. It's my understanding that this is currently under consideration. Four North Ave. businesses were nominated for OPRF Chamber of Commerce Spotlight Awards: Na Siam Oak Park Thai Restaurant, 6851 W. North in Oak Park; Sergio's Place, serving Mexican food at 6966 W. North in Chicago, Serrelli's Finer Foods, an Italian deli at 6454 W. North in Chicago; , and Wonder Works, A Children's Museum in Oak Park, 6445 W. North in Oak Park. Dr. Mary Ann Bender - Advanced Physical Medicine won this year's award for Outstanding Customer Experience. Please patronize these fine establishments and remember that The North Avenue District is a great place to dine, shop and find medical care. The Chicago Tribune Food & Dining section has recognized the Northwest Side as a center for Italian dining. North Avenue restaurants Johnnie's Beef and Massa Cafe Italiano were recommended. Congratulations to these restaurants, as well as Galewood and Elmwood Park! At its November 6th meeting, the Village Board will vote on a motion to reject the Transportation Commission's recommendation to install speed tables or bumps on the 1200 Blocks of N. Columbian, N. Euclid, N. Linden, and N. East Avenues. Staff does not support these. Unless a trustee moves this item from the consent agenda, the recommendation will be rejected https://oak-park.legistar.com/LegislationDetail.aspx?ID=3202891&GUID=57D8D138-F2C0-49CD-9F97-DA56402E5D18 If you live or do business on or near these streets, I urge you to attend this meeting and let the Board know how you feel. Ironically, at the same 10/16 meeting, the Board unanimously approved special use zoning for a new daycare center at 6441 W. North--just where the former King Spa got closed down for prostitution. Welcome Oak Park Fundamental Learning Center! T-NAD's efforts to revitalize North Avenue were recognized in this Wednesday Journal op-ed, which identifies many of the challenges we face. http://www.oakpark.com/News/Articles/10-24-2017/North-Avenue-gets-noticed/ The recognition is much appreciated! The North Avenue District supports Oak Park's proposed massage parlor ordinance, which tightens regulation. At the 10/16 Village Board meeting, we suggested some changes. For example, background checks should include civil/administrative court records as well as criminal. We thank Village staff for taking the initiative to develop this ordinance. The North Avenue Business Subcommittee meets on the 3rd Thursday of odd months; next meeting is on November 16 at 1:30 p.m. at the 25th District HQ (Grand and Central). The Business Liaison Officer is Officer James Mackin; (312) 746-5090, James.Mackin@chicagopolice.org. The Business Subcommittee is a great way of working with Chicago police to make the North Avenue District safer and better. CAPS (community policing) meetings for Beat 2513 (North to Armitage, Austin to Harlem) are held the fourth Tuesday every other month, 6:30-7:30 pm in the Amundsen Park fieldhouse, 6200 W. Bloomingdale. Next meeting is Nov. 28. Galewood residents and business/property owners are encouraged to attend. Zone meetings are held monthly at 7 pm. Zone 1 meets on the month's third Tuesday at Hatch School. Zone 2 meets on the first Tuesday at Mann School. North Oak Park residents and business/property owners are encouraged to attend. In both Zone 1 and Zone 2, September crime was up from August, 9/2016, and YTD. Extra police resources were allocated to deal with the recent rash of carjackings in northeast Oak Park. A suspect believed responsible for these incidents was apprehended thanks to an alert citizen who called to report a suspicious person matching the description from a previous incident. Citizens are urged to report any suspicious activity to the Police Department's Anonymous Crime Tip Hot Line at 708.434.1636. Anonymous tips also can be made online at www.oak-park.us/crimetip. Please notify Public Works (publicworks@oak-park.us or 708-358-5700) to report street lights out, pot holes, dead animal carcasses, gym shoes on cable/telephone wires, signs in parkways, etc.